“Crazy or Normal? “asks a flash animation banner and posters questioning the traditional and stereotypical division of labor between women and men. The radio spot features the wedding ceremony during which the betrothed Jana and Vlado pledge that they both know the website www.ruzovyamodrysvet.sk and that Vlado likes to cook and vacuum while Jana doesn’t have problem with changing a light bulb or hammering down a nail .... “Dear listeners, do you take this couple as your role model? “asks the wedding officiant in the campaign radio spot. 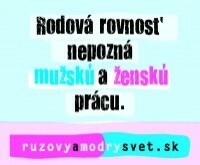 And the message of the campaign continues: “Gender equality knows no male and female work. There is only work that needs to be done“. The campaign There is Only Work that Needs to Be Done started on 8 April 2008. You can find the campaign banners on websites of our sympathizers and on Pokec www.azet.sk, and listen to our radio spot on the radio station Fun and Kiss. Two campaign posters are placed also in secondary schools, colleges and student dormitories. As a special campaign bonus we offer for free a test to measure gender (in)sensitivity via 7 statočných otázok (The Magnificent 7 Questions). And we do not stop there – we also offer treatment, rehabilitation and prevention – for instance through reading! During the campaign, in the section in the reading room each day one new text is added to 7 statočných textov (The Magnificent 7 Texts) offering a little food for thought about gender division and labor and gender equality. The campaign There is Only Work that Needs to Be Done is a culmination of the three-year project ruzovyamodrysvet.sk (pinkandblueworld.sk). At the beginning of the project stood the book about gender stereotypes Ružový a modrý svet (Pink and Blue World) parts of which you can also read on and download from our website. Gender stereotypes influence how we act and what we do in our daily lives and impact the functioning of the whole society. Its important part is the division of labor between women and men – both in the private life and professional life. Therefore, our project is about gender stereotypes, gender sensitive education, about hierarchical gender division of labor, desegregation of occupations, equality of opportunities but mostly about how we can transform asymmetric hierarchical relations into relations based on mutual respect and cooperation. The campaign is the culmination of one project, but in the area of gender sensitive pedagogy and gender equality in school and out of school there is still much „work that needs to be done“. Therefore we want to invite as many people as possible to chip in. You can download all campaign materials (the banner, radio spot and posters) from our website and further spread them in the name of more just division of labor between girls and boys, women and men. Thank you for chipping in!